How To Paint And Draw Art Videos By North Queensland Artists. These Videos About How to Paint and Draw Feature Tropical Artists. Many people are interested in learning how to paint and draw or how to develop original prints from their drawings and sketches. As noted on the previous page, three artists, from Port Douglas in Tropical North Queensland, decided to engage the team from Put Some Colour in Your Life to film them in their studios, thereby promoting their art and the region. But, because the series is an educational one, you will be able to learn much about how to make various types of art by watching the videos on this page, which were made as a result of that visit. Each runs for about twenty five minutes. Enjoy! If you are a professional artist living in North Queensland and would like information about being featured in the Tropical series please contact me via the form, below. The three videos all start with the journey up the 'coast road' from Cairns to Port Douglas, with Graeme on his signature Harley Davidson motorbike. Is that introduction inviting enough to tempt you to come visit us? Anna Curtis is an artist who specializes in reduction lino print making. The process that she uses gives her work a richness and depth as she builds layer upon layer of colour, carving away and discarding areas of lino until only the last (usually the darkest) colour block remains. Reduction lino-print maker, Anna Curtis. Tania Heben has been painting landscapes of the Port Douglas area for twenty years or more. The brooding mountains, sparkling ocean, dark rainforest, swift running rivers and busy sugar cane plantations all form a backdrop for her depiction of the lifestyle of those who also call the area home. Painter, Tania Heben. demonstrates her painting methods. 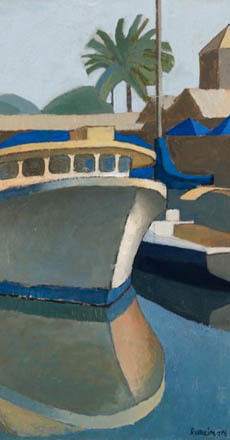 Mary Ann Runciman paints boats, especially those that are in the dry dock, their elegantly curved hulls revealed. But she also paints people - their portraits or their naked bodies, often further developed into semi-abstract patterns, as she demonstrates here. Mary Ann Runciman paints boats and stylised figures, using oil paints. 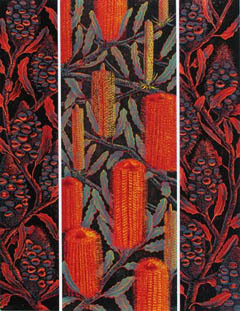 Please click on each image to visit another page about the artist. If you have enjoyed these videos about how to paint and draw, as well as how to make lino prints, please let us know via the form below.